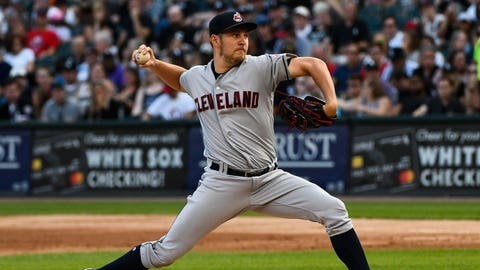 CHICAGO (AP) — Trevor Bauer pitched two-hit ball into the seventh inning before getting struck in the right leg by a line drive, and Michael Brantley and Jose Ramirez hit back-to-back home runs to lift the Cleveland Indians to a 3-1 victory over the Chicago White Sox on Saturday night. Bauer won his fourth straight start. He gave up one run and struck out eight before Jose Abreu’s liner leading off the seventh struck him high in the back of his leg. The ball ricocheted toward first baseman Yonder Alonso, who stepped on the bag for the out. Cody Allen worked the ninth for his 22nd save in 25 chances. He gave up a leadoff single to Yolmer Sanchez but struck out Avisail Garcia to end the game after Daniel Palka — who homered in the ninth in Friday’s 1-0 victory — flied to deep center. Shields allowed two earned runs and seven hits in seven innings. Yoan Moncada homered in the third, but the White Sox committed three errors. Indians: Edwin Encarnacion was examined because of discomfort in his left biceps and there wasn’t a decision yet on whether to put the slugger on the disabled list. Francona said the AL Central leaders were awaiting the results of an MRI. Encarnacion was being checked in Cleveland. … RHP Corey Kluber left the ballpark feeling ill prior to the game, though Francona said he should be ready to make his scheduled start against Cincinnati on Tuesday. White Sox: Manager Rick Renteria said OF Leury Garcia (strained left hamstring) continues to ramp up his activity, though the White Sox are “probably three or four days away” from deciding if he will go on a minor league rehab assignment. Garcia was injured on Sunday at Tampa Bay.